“Event” programming, once epitomized by elongated miniseries such as Shogun and The Winds of War, is getting a second wind on the Big Four broadcast networks. 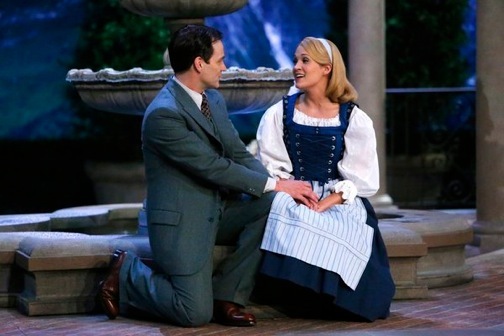 These wheels were already in motion before NBC’s The Sound of Music Live went dough re mi in the national Nielsen ratings with 18.6 million viewers. NBC, which will repeat Sound of Music this Saturday (Dec. 14th), is now “circling a couple of titles” in preparation for another holiday presentation of a Broadway musical classic, according to an article in Tuesday’s New York Times. Quickly on those heels, the Peacock announced Wednesday that it will air a four-hour Rosemary’s Baby miniseries, with a cast soon to be announced for a January production start in Paris. Earlier this year, NBC snagged the sequel to History channel’s 10-hour The Bible, which like Hatfields & McCoys was a ratings smash for the advertiser-supported cable network. NBC’s followup will be titled A.D.: The Bible. During the glory years of multi-part network miniseries, NBC aired the 12-hour A.D. in 1985. Its star-driven cast included Ava Gardner, James Mason, Susan Sarandon, John Houseman and Anthony Andrews. Fox also is event-minded of late, with M. Night Shyamalan’s eight-hour “intense mind-bending thriller,” Wayward Pines, due next year. The network additionally has 24: Live Another Day coming this summer at a two-for-one length of 12 hours. ABC has been slower on the “Event” draw so far, but expect some announcements soon. This is, after all, the network that pioneered the miniseries genre with mega-hits such as Rich Man, Poor Man, Roots, The Thorn Birds and the aforementioned Winds, a mega-expensive 18-hour production that led to the even longer War and Remembrance. Those lengths are still very much in the past. But in times of Twitter, Facebook, Netflix and myriad conventional TV channel choices, it’s increasingly vital to stand out in a crowd while also getting those crowds buzzing. “Social media played a pivotal role in the success of the show,” Sound of Music co-executive producer Craig Zadan told The Times. Twitter and Facebook traffic “lasted the entire performance and beyond,” he said. Live productions are rich in social media appeal, whether it’s NBC’s risk-taking presentation of Sound of Music, NFL/college football, awards shows or talent competition series such as NBC’s The Voice, Fox’s American Idol or ABC’s Dancing with the Stars. Real-time sniping can be brutal, but the end result is often far prettier. In NBC’s case, Sound of Music was its most-watched non-sports program on a Thursday night since May 13, 2004, when Frasier had its series finale. Underwood’s feelings may have been bruised in the process. “Plain and simple: Mean people need Jesus. They will be in my prayers tonight,” she tweeted. But hey, the Peacock is crowing thrice -- and no doubt will give Underwood a big role in A.D.: The Bible if she wants one. Snark the herald angels sing. Hallelujah.